Sweet! 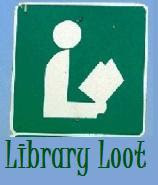 Welcome to Library Loot! My local libraries don't shelve much romance either, especially the newest mass market paperback type. They just don't get those. I get library envy when I hear what other people can get at their libraries. I end up borrowing a lot of YA, mysteries and some of the romances that make it out in hardcover. I have the first two of your loot books already on my personal TBR pile, but what a score for you to find them at the library! Several of the books you picked up are on my TBR pile. The Christmas Countess is pretty high on the pile. I'll probably read it two books from now. My library lets people reserve and request paperbacks from any branch. My own personal library puts the public library to shame so I don't check out books from there, but I'm wildly waving my arms at you to read The Madness of Lord Ian MacKenzie. There is no brogue in THE MADNESS OF LORD IAN MACKENZIE. Lord Ian and his brothers speak regular English with a hint of a Scots accent. I have three of these in the TBR - just missing the Basso. And OMG - Nathan Kamp DOES look like Prince Humperdink! LOL If I actually found Kamp attractive (which I don't) I might be mad at you for planting that suggestion in my brain. Libraries that don't catalog paperbacks need to be shot. OK, not really - they just need to get a clue. It takes no time at all to throw up a very minimal record on the catalog (Seriously, all they need is title, author, ISBN and publisher) and people could actually FIND them. This is a massive pet peeve of mine - can you tell? I don't understand why a library WOULDN'T catalog paperbacks. They want people to check out books, right? I'm sure the more books checked out equals more funding for them. Anonymous - I didn't say they didn't catalogue paperbacks. I said they catalogued them differently so you can't search for them in the computer. I think the reason our library doesn't (when I asked a librarian) is they consider paperbacks too fragile to be worth the trouble - they wear out faster than hardcovers and take more damage and are taken out of circulation sooner so what's the point? kind of attitude. Which I think is bull crap. I was responding to Wendy, not you. Anon: What AnimeJune said. It's the format, not the content. Paperbacks aren't "meant to last" - so libraries don't want to waste time and man-power cataloging them. However, it has gotten a lot better in recent years. Mostly because cataloging means better statistics, better collection development, and better access to the collection. Librarians are slowly (gah!) starting to realize this. My employer didn't start cataloging pbs until around 2003 (before my time) and it's amazing how our stats (ILL and within our system) shot up. Gee, ya think? Also, ever since hard cover quality has gone down the toilet (shoddy bindings, cheap paper - I could go on and on), paperbacks have become a little less of a punching bag. Quality is pretty much crap across the board now - not just reserved for paperbacks anymore. Welcome to Library Loot! I am glad to see another romance reader playing along! I am pretty lucky in that my library has a pretty good romance section. My only criticism is that some times it takes them a long time to get on board with new authors. I bought the Jennifer Ashley...still haven't read it! I love Sabrina Jeffries books, but I was glad that I was borrowing some of those earlier books from the library. It was only in the later books that she become an author that I buy rather than borrow.